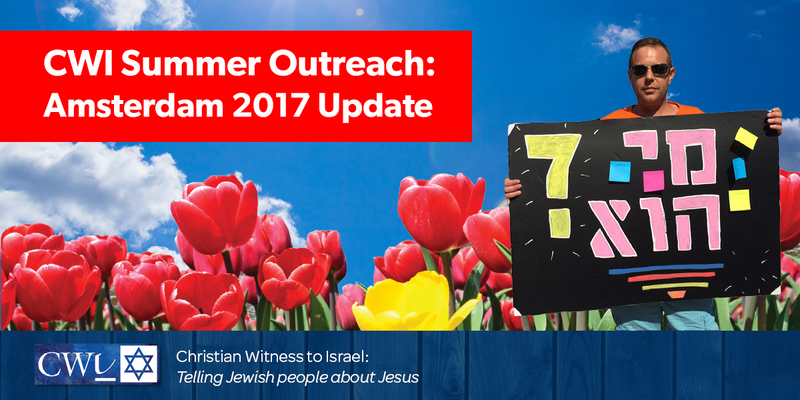 Jewish Outreach Amsterdam – He went leaping and praising God. He went leaping and praising God. 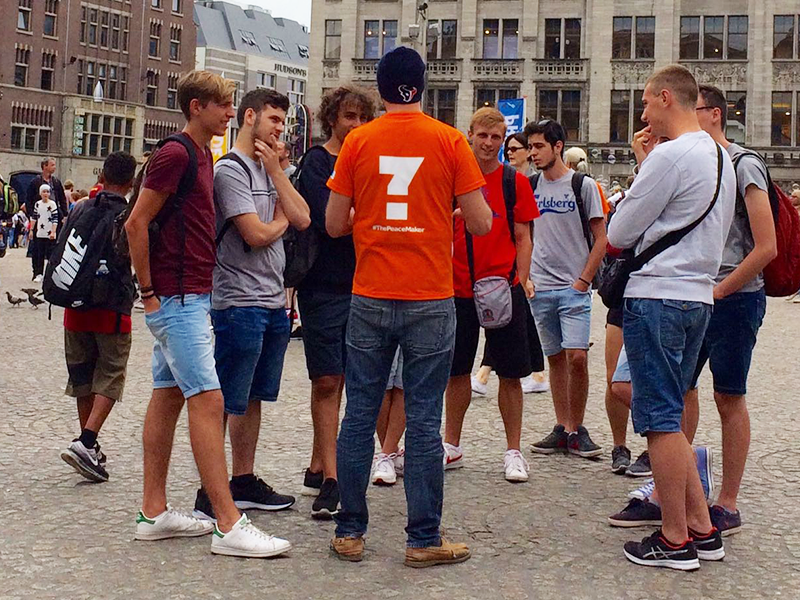 Please continue to pray for our summer outreach team as they tell Jewish people about Jesus in Amsterdam. The team has been out since Monday – conversations about the Messiah have taken place throughout each day and thousands of postcards, leaflets and invitations to gospel meetings have been handed out. 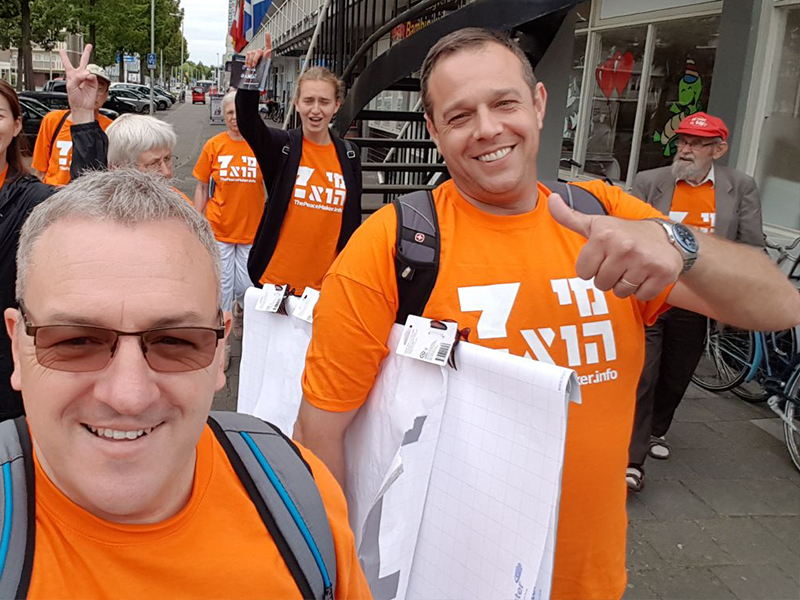 While part of the team have been focusing on the city centre, others have been out in the local neighbourhoods and knocking on the doors in the Jewish quarter of Amsterdam. French CWI missionary Aurel had an amazing opportunity during a visit to a Jewish neighbourhood yesterday. After several hours delivering gospel leaflets to Jewish homes, Aurel found himself outside an Israeli Kosher restaurant. He approached three Orthodox Jewish men outside and greeted them with ‘Shalom!’ One of the men looked at Aurel’s t-shirt and asked him the question back, ‘Who is He?’ Aurel replied that ‘He’ is Jesus, the Messiah who came to bring peace on earth. Another of the men, a tall Hassidic man, was clearly not impressed with this answer but listened as Aurel explained that there was no contradiction between the Old and New Testament Scriptures and how Jesus had come to fulfil the Torah, not do away with it. They went on to discuss man’s inability to keep the Law of Moses perfectly. Aurel also had the opportunity to tell the men that there is no contradiction in being Jewish and following Jesus. By the end of their time together, the restaurant owner asked when Aurel was going to be back to continue the conversation and for some delicious Israeli food! Please pray for the salvation of all three men. 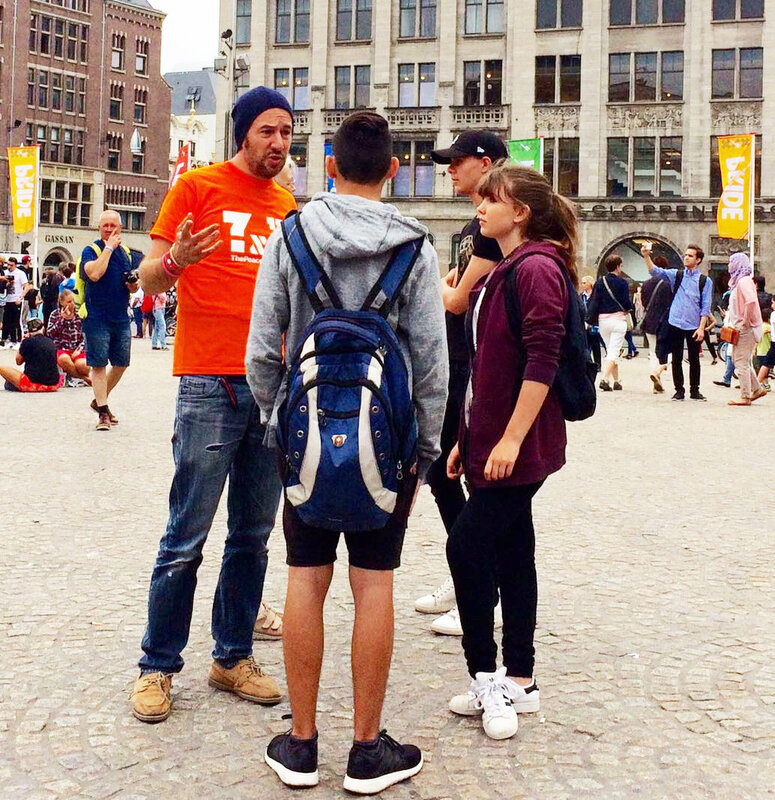 Israeli CWI missionary Igal met a group of young people in the streets who were openly smoking marijuana which is freely available in the coffee shops of Amsterdam. He challenged them as to why they felt the need to smoke and they replied that it made them feel peaceful. This gave Igal the chance to share his own testimony with them – how his life had been destroyed through drug abuse but how he found true peace when Jesus entered his life. Having heard Igal’s story, the young people began asking questions about how it was possible for Jesus to bring such a drastic change in a person’s life. Igal went on to share the Good News about how Jesus offers the forgiveness of sins and transform lives. Before they left, Igal and fellow Hungarian CWI missionary Bogi, prayed with the young people and Igal challenged them to seek God and ask him to reveal Jesus to them. They promised they would so please pray that each of them would know true repentance and faith in Jesus for themselves. Yesterday the team delivered hundreds of leaflets, explaining who Jesus is and what he came to earth to accomplish, to approximately half the Jewish homes in Amsterdam. The other half will be getting them through their letterboxes today in time for Shabbat this evening. 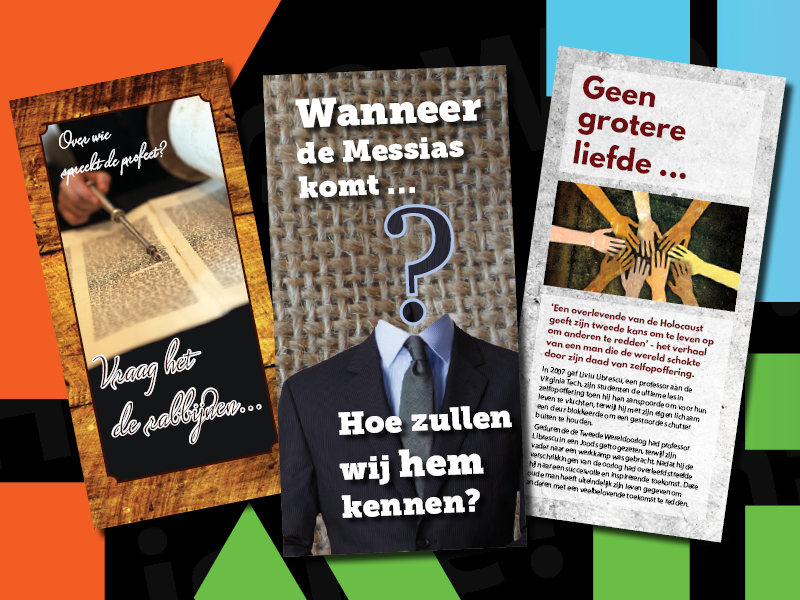 The Dutch leaflets, which were produced specially for the outreach, are on the subjects of ‘When Messiah comes how will we know him?’, ‘No greater love,’ and ‘Ask the Rabbis’. They all clearly lay out how the promised Messiah would come and save his people from their sins. They also give people details on how to contact the outreach team for free literature and to speak about Jesus. 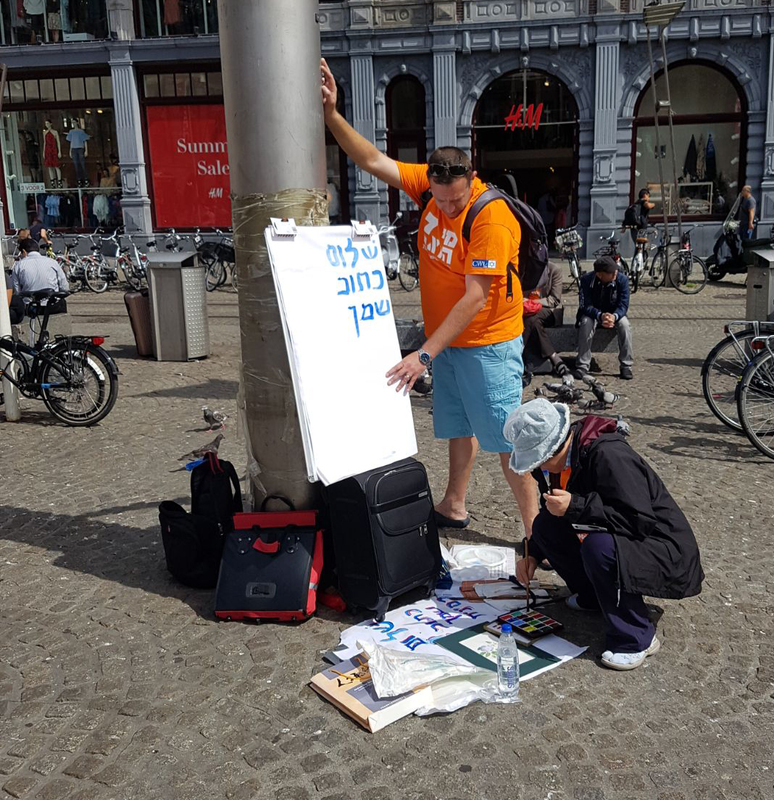 Pray that Dutch Jewish people will read the leaflets and get in touch with the team and that, through their witness, the Lord will bring many Jewish people to himself. Thank you for your prayers and support as we partner together to see Jewish lives in Amsterdam changed by Jesus!